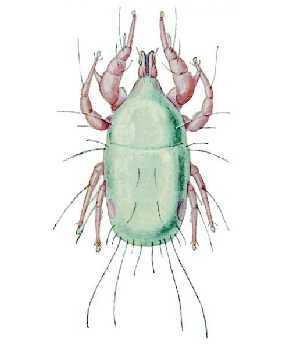 Grain mites are not really insects, but closely related to the insects. They are microscopic (1/50”), pale grayish white, smooth, wingless, and soft bodied. Populations can increase to such large numbers that grain appears to be covered with a moving layer of dust. Adults have 8 legs, while larvae only have 6 legs. Each leg has one claw on the end along with a sucker. Grain mites are cosmopolitan, although they are more common in temperate regions with cool moist climates. Females retain the spermatophores acquired from the males. Since each mating yields 1 spermatophore, the number of matings can be determined. Females can mate between 16 and 40 times. Egg laying begins the day after eclosion and continues until death. Average egg production is 230, but can reach over 600 if fed powdered milk, wheat germ, yeast, cheese, or seeds under favorable conditions (20˚C (68˚F) and 80% Rh). Daily egg production ranges from 1 to 24. 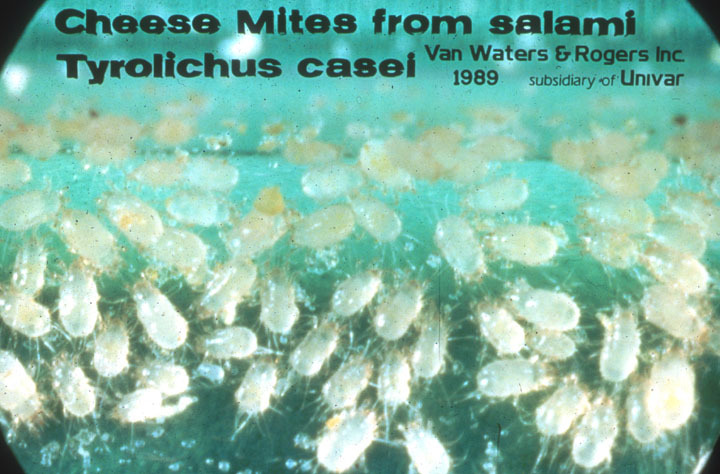 Populations of grain mites are very sensitive to moisture conditions. If the grain moisture drops to below 13.4%, all individuals will die. They thrive at 24% m.c. Grain in the range of 15 to 18% m.c. provides conditions suitable for serious infestations. Environmental conditions are perfect for extreme population growth at temperatures between 20 and 25˚C (68 to 77˚F). They will not infest grain in the field. Development time for one generation ranges from 78 days at 4˚C (39˚F) to 9.2 days at 28˚C (82˚F) at 80% Rh. Longevity depends upon temperature, Rh, food, and reproductive activity. Under ideal conditions, females live 42-51 days (average) (maximum 63 days). Male survivorship is generally a few days less. Virgin females live the longest (83 days up to 103 days) while virgin males live about 50 days. Grain mites are sensitive to antibiotics and antimicrobial agents. Low dosages inhibit their development, higher doses increase mortality and decrease reproduction. Mites will attack not only grain but cheese, flour, pet food, oilseeds, medicinal herbs, hay, deep litter of poultry houses, abandoned beehives and just about any food used by man. Grain mites can feed on fungi so food that is going out on condition is often infested. In grain, mites eat the germ, although the endosperm may be eaten if it is moldy. During heavy infestations cast skins and dead bodies accumulate into fluffy masses that can be blown around. It is a common inhabitant of house dust and is strongly allergenic. Vacuuming is required if areas are heavily infested. These signs indicated that storage conditions are too damp. Infested materials in homes should be discarded and the infested areas thoroughly cleaned. In commercial facilities infestations must be fumigated to gain control over these pests. Heavy infestations have a characteristic sweet or minty odor which usually necessitates the food be destroyed.